The tweet went out last month. 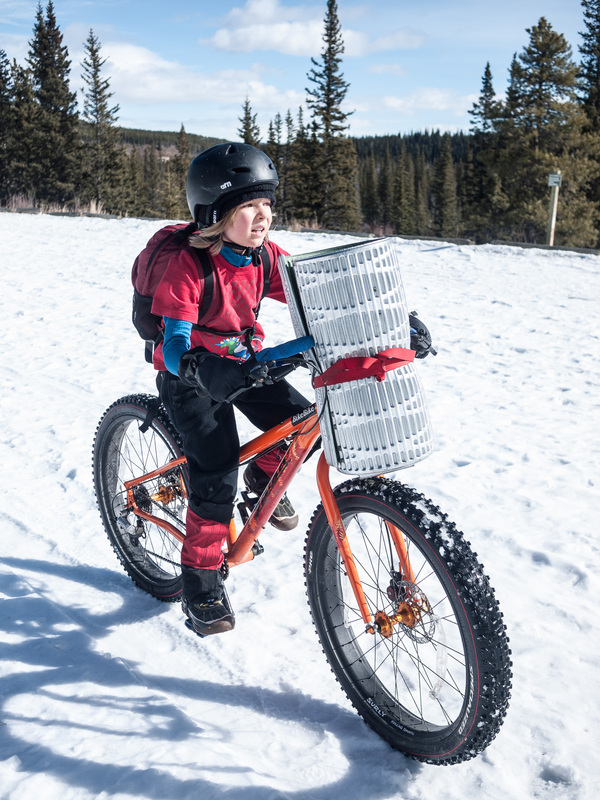 I was intrigued, I love bikepacking with kids! 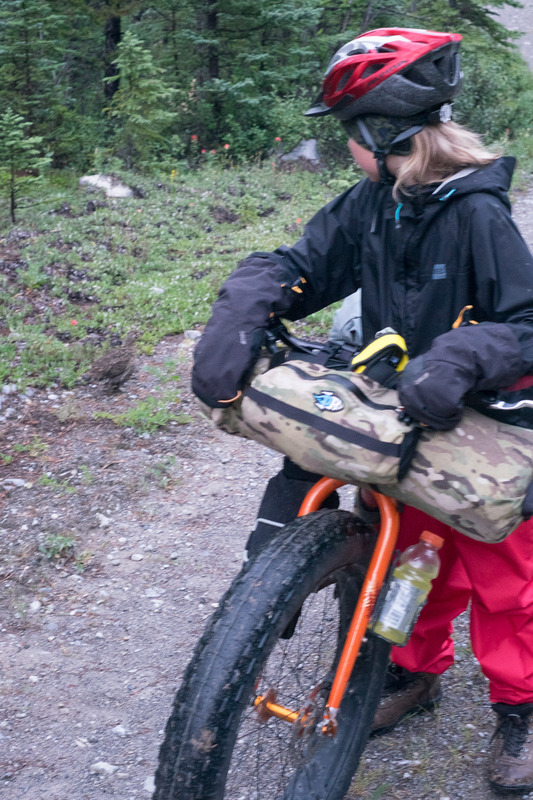 We wanted to get in some bikepacking and we decided to tag along with Adam and Thomas. 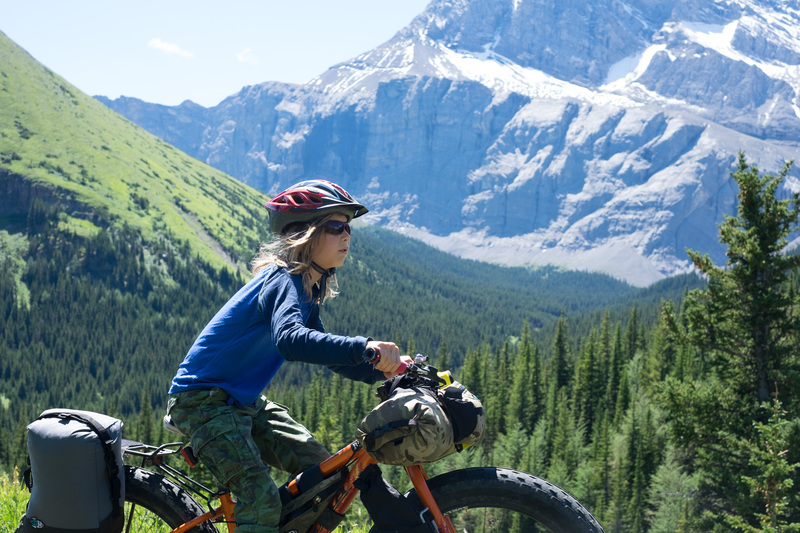 The Minnewanka trail is a favourite of ours, and family bikepacking is never a bad thing. As the date approached, we decided that just Fiona and I would go, which would give me some time away with her and let Tadhg have a longer ride with me later. The Friday came and though we had a couple of delays getting out of the house, we hit the road aiming to meet Adam in the parking lot at the trailhead. Adam was about half an hour ahead of us at this point, so fortunately he decided to start riding rather than wait for us. 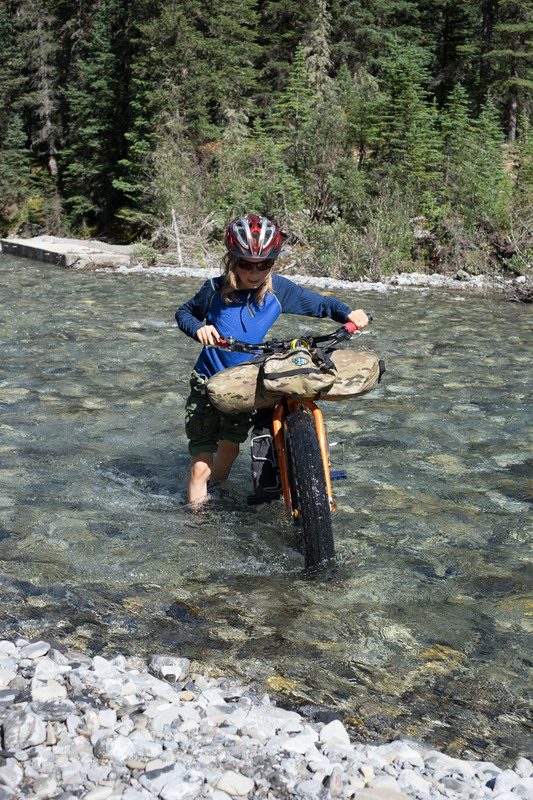 This was Fiona’s first bikepacking ride with the fatbike, and as might be expected, it was a lot for her to handle. She was determined to prove to me that it was the right bike though, which probably saved me having to listen to a lot of whining. It was fairly slow going though since Fiona had to push up some of the steeper hills at the beginning of the trail. 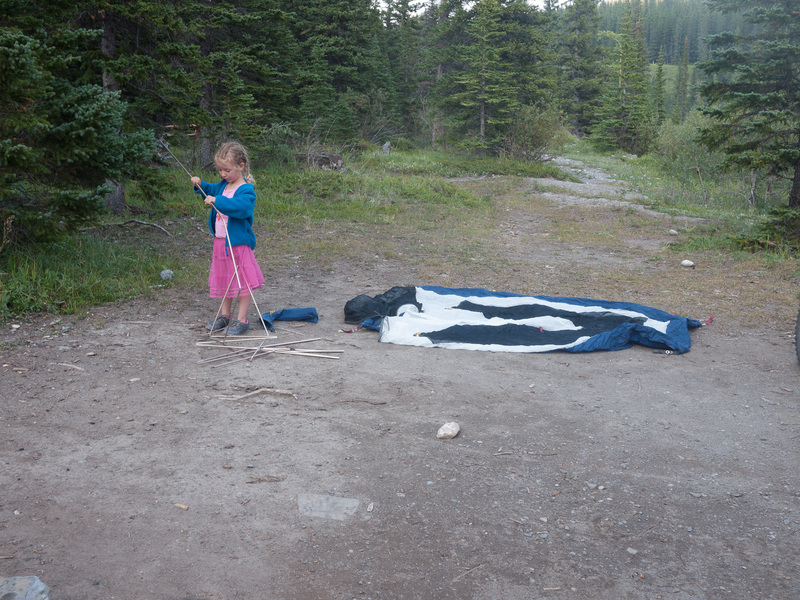 When we got to the campground, Adam had set up his tent and was throwing rocks in the water with Thomas. Fiona went down to meet them and immediately became Thomas’s rock throwing buddy. I set up the tarp and soon they came up to see what I was doing. Like most modern backcountry campgrounds, the food prep area at LM8 is quite a way from the tent area. We made our way over to have some dinner. I brought an alcohol stove on this trip, so there was lots of time to gather firewood while waiting for our water to boil. Apparently Thomas’s favourite thing in the world is campfires because he was entranced, and spent the rest of the evening putting wood and rocks in the campfire, with a short break for s’mores. In a gesture of foresight and generosity, Adam shared beers with me as I had tragically neglected to bring any. Though I hadn’t thought the rocks in the fire were that good an addition, they did provide us with some entertainment since they were glowing red with sparkles by the time we were putting out the fire for the night. Fiona always sleeps her best in the backcountry, and this was no exception. Fiona sometimes has nightmares in which she shouts in her sleep, and apparently Thomas does too, though they were far enough away that I wouldn’t have noticed if I hadn’t been awake when it happened. Fiona slept in until 9:15 which is somewhat unprecedented, but I was glad she got enough sleep. After a leisurely breakfast, (Adam and Thomas were up at 8 and had eaten by the time we got up) we packed up and hit the trail out. The riding went really well as the kids motivated each other. Fiona was showing off for her younger buddy, and he in turn was pushing himself to ride as much as her. 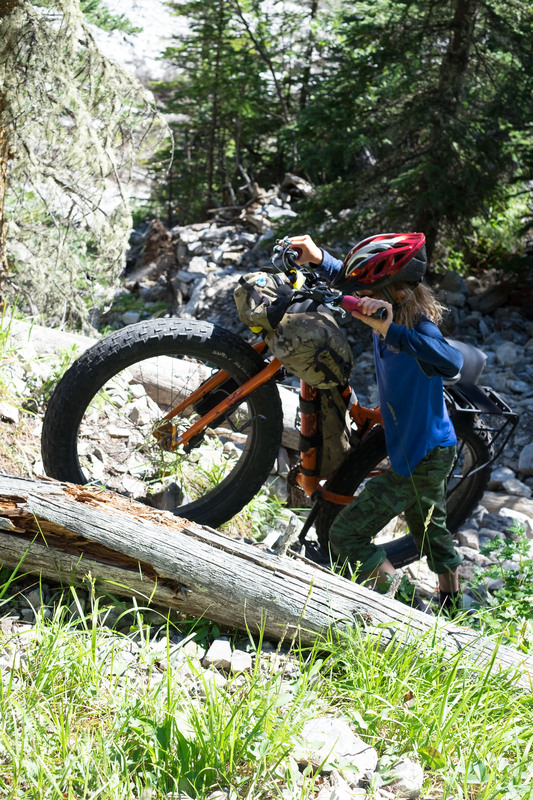 Fiona had the advantage of size and low gears, but Thomas has some top-tier bike skills and the determination of a 4-year-old. It made the ride more fun for everyone and increased Thomas and Fiona’s friendship even further. 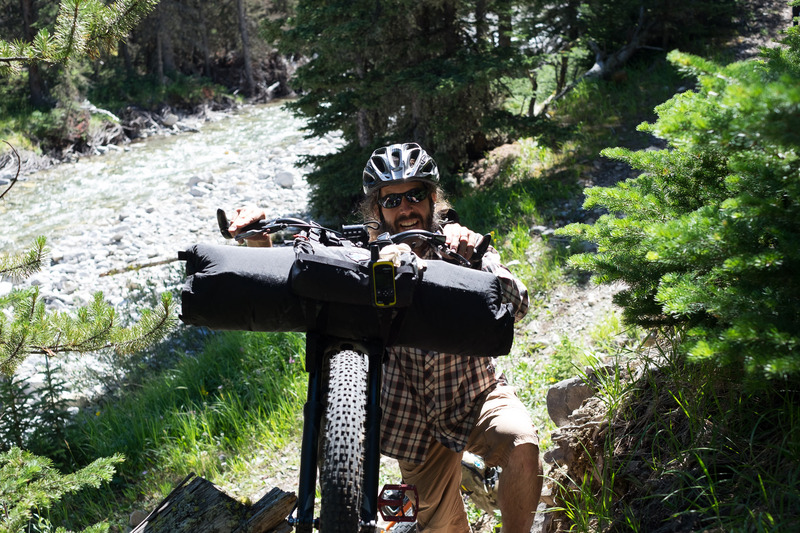 Adam’s big dummy as a bikepacking bike and sag-wagon combination worked super well. He has it set up as a 26+ mid-fat with wide rims and nearly 3″ wide tires. It handled the gravely trail well though it may also have been Adam’s bike handling skills. Adam made a fun video of the trip with his GoPro camera here. If I have one complaint about this trip it is that it wasn’t long enough, but that’s probably a good complaint to have. 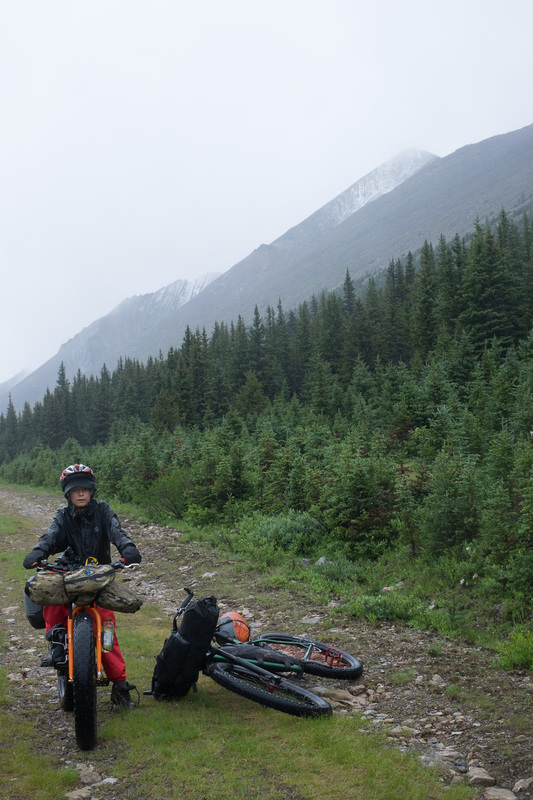 It isn’t every day that you line up three consecutive days for bikepacking with your son, so when it happens – you take it, even if the weather calls for a very wet and cold start to the trip. We have done the Elbow loop as a day trip, hiking trip and bikepacking trip a number of times now. It was time to move on to something a little more challenging. I cobbled together a potential route that had a large number of alternates in case of troubles. I thought it was going to be a stretch, but might be possible. Thursday evening we set out from the parking lot in moderate rain. Tadhg wasn’t feeling his best and felt sluggish on the climbs, but was happy enough. The rain wasn’t excessive, but there was a consistent drizzle. We had planned to make Tombstone pass by sundown but ended up only halfway, near where the Romulus campground used to be before the ’13 floods. As we set up the tent, the rain got serious. Then it got worse. By morning, the rain had tapered down to a steady shower. Neither of us were in a big hurry to get out into it, so we stretched breakfast and coffee till nearly 11 and hit the trail around 11:30. The plan was to get 45km further down a couple of trails before settling down for the night. Deep in a washout with a wet camera. I often say that single digit temperatures and rain are much colder than temperatures below freezing and this was no exception. We struggled with rain-softened trail and low energy. Tadhg wasn’t hungry, which is usually a sure sign of trouble. 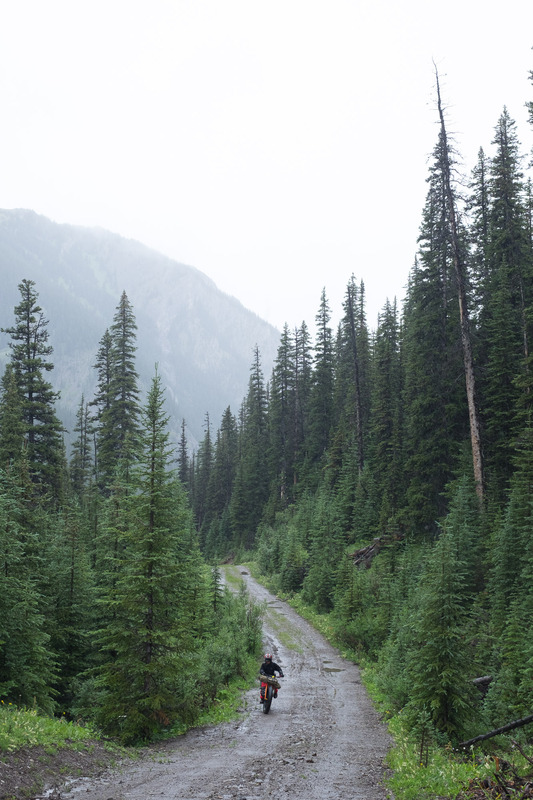 By 5pm, we had made it less than 20km and had crossed only the smallest passes – hardly worthy of their name. 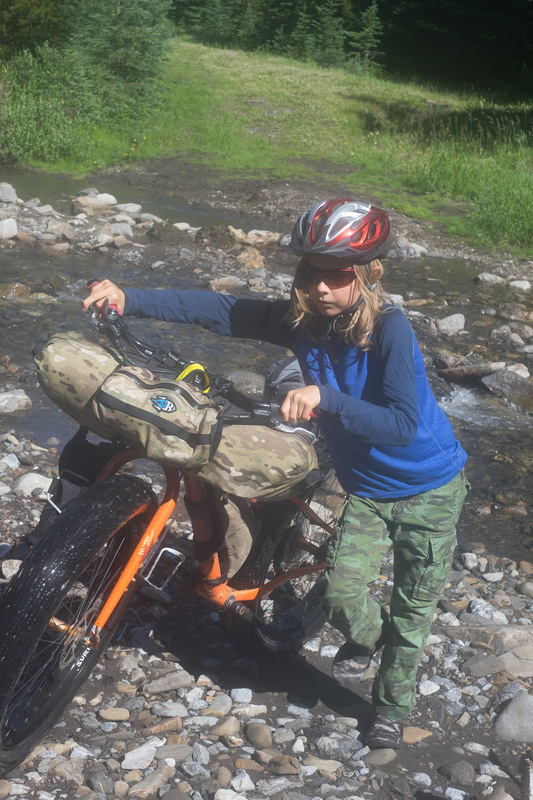 We came to a river crossing and decided to look for a place to camp – conveniently, there was an old horse camp exactly where we were. The rain let up as we were setting up camp and things started to look up. I revised our route plan to remove the second half so as to avoid getting too far away from the car to be able to get back on Sunday. We left the camp better than when we started by burning the garbage that had been left in the fire pit and surrounding area. Saturday morning started sunny and warm with about half a dozen river or creek crossings and then a major washout. I scouted the trail and there was a clear way through, it was just going to take time. If we had been able to estimate how much time, we would have continued. I just didn’t think it was prudent to move away from the car down an unknown trail to possibly put us out of reach of our sunday evening deadline. 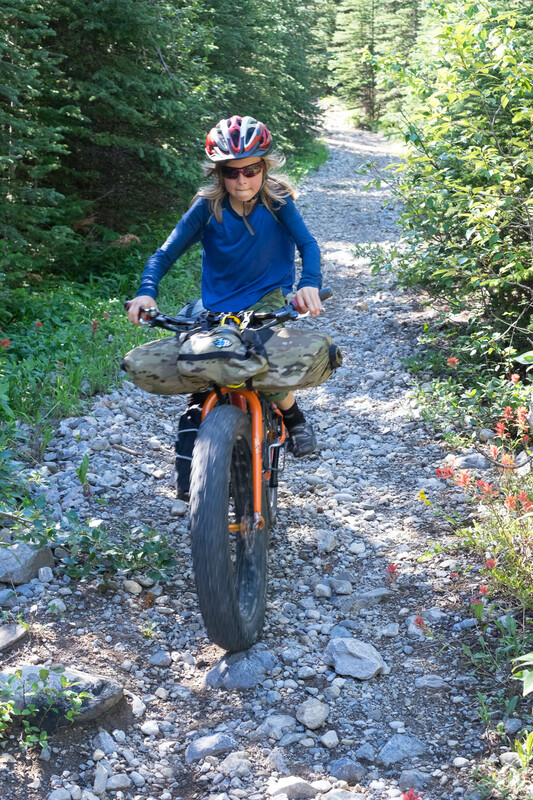 We thought about it for a while and even though we were both in a better mood and Tadhg had energy, we decided to turn back the way we had come and ride out the remainder of the Elbow loop as a very easy 2 days. Though we were taking it easy, it was early when we got back to Tombstone campground. We filtered water and ate a bunch of candy. Then we met up with a couple of fatbikers out on a day trip. 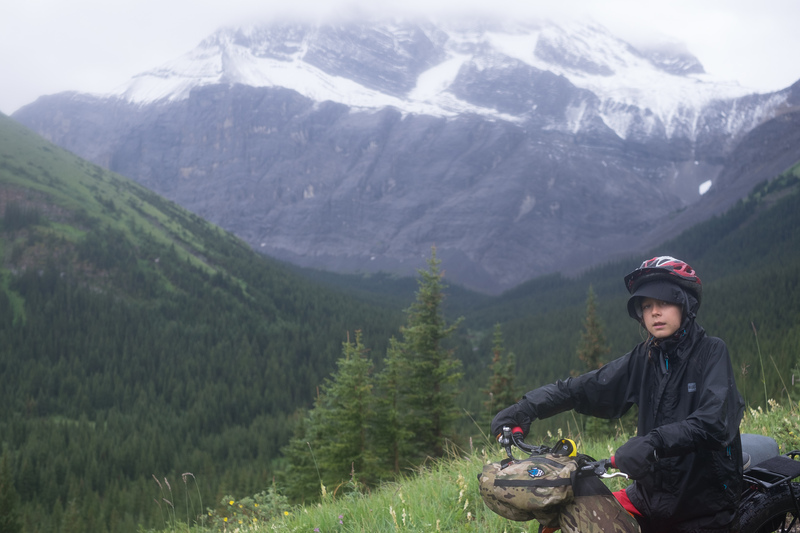 We set out down the Big Elbow side of the trail knowing that the washouts would slow us down by quite a bit, and thinking we would ride for a couple of hours and then camp for the night. 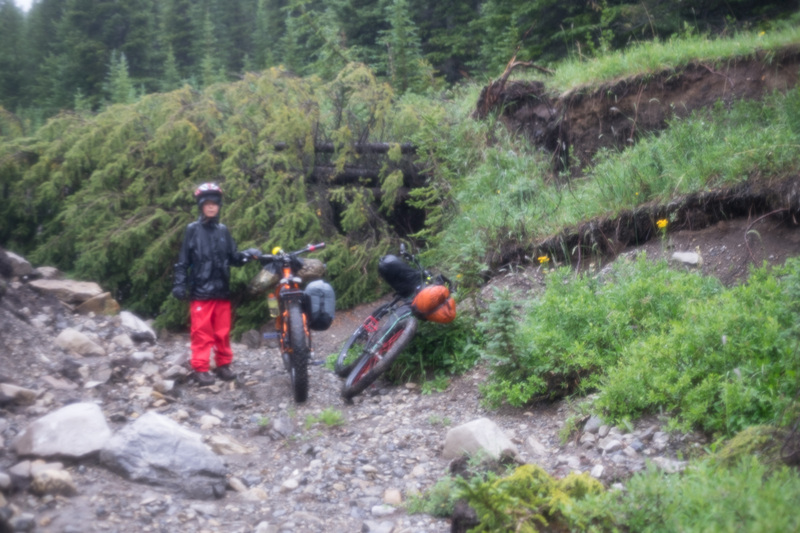 The washouts weren’t as bad as we expected, and Tadhg was riding really well – easily clearing the many rock gardens and rough trail patches. We took lots of breaks and stopped frequently to chat with the fatbikers, but we were running out of trail. As we started to set up camp, Tadhg pointed out the futility of camping less than an hour from our car and so we re-packed and hit the trail. 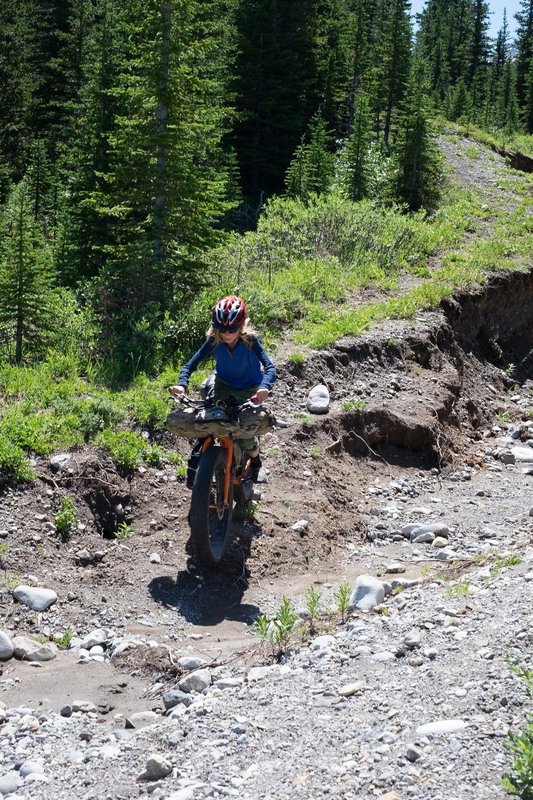 We rode full out on the last section, passing some unladen bikers on full suspension rigs (much to their dismay). We were home shortly. Overall it was a very successful bikepack even though we got less than a third of the planned route completed. 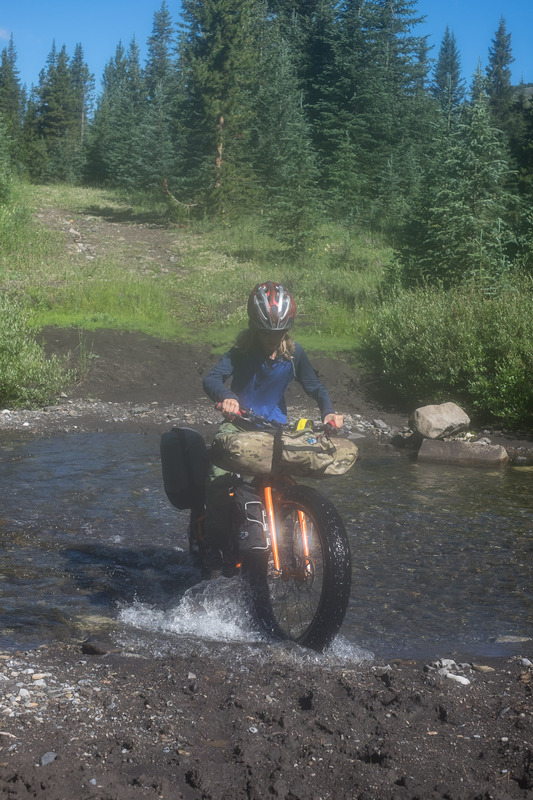 This was the first time I had my Krampus with the suspension fork out for bikepacking and it was close to ideal. The miserable weather at the beginning let me us have a taste for hardship, and was a great gear test. By not forcing Tadhg to continue we managed to keep the ride fun and improve the chances of his coming back for another attempt. 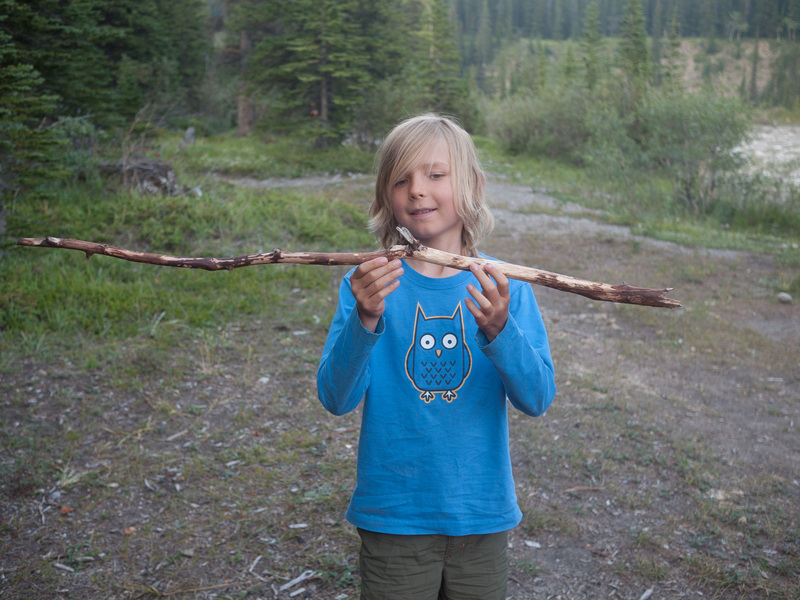 The kids and I got back recently from our trip to the Chilcotin mountains of BC. We tricked my friend Vik into coming along and carrying some of our heavy food. 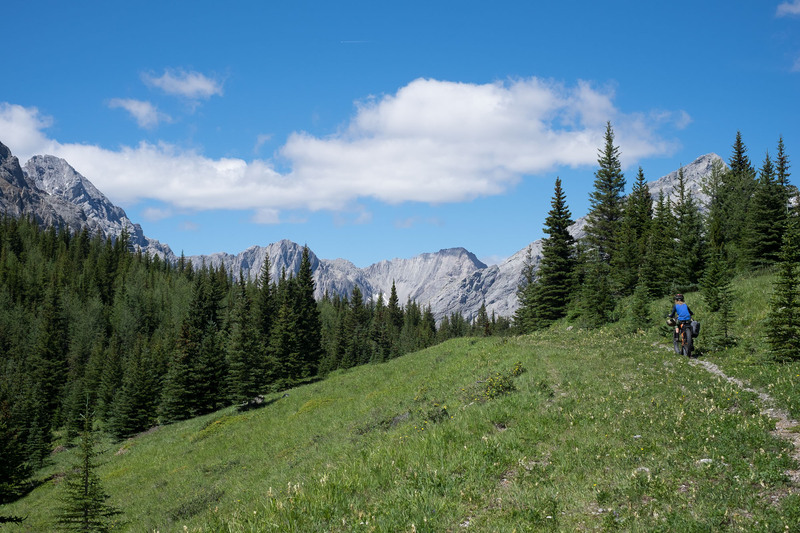 Our plan was to take from 5 to 7 days to make a loop up Gun Creek, over Deer Pass and down past Spruce Lake and back to our original parking spot. Having kids along meant a lot of extra weight in gear and food since they eat similarly to and adult and sleep in a sleeping bag at night. Summer of 2012 was drawing to a close we wanted to get something of an adventure in before the summer ended. 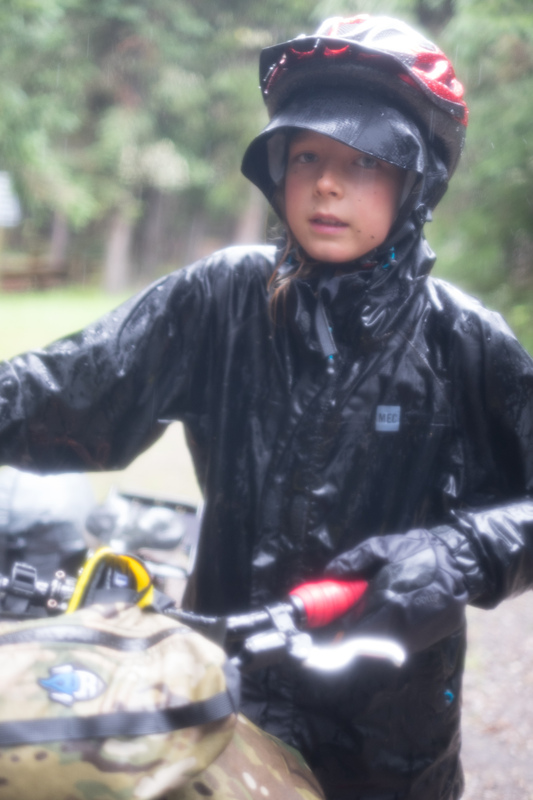 So the two kids and I decided to go for a five day, four night bikepacking trip in the Elbow Valley. 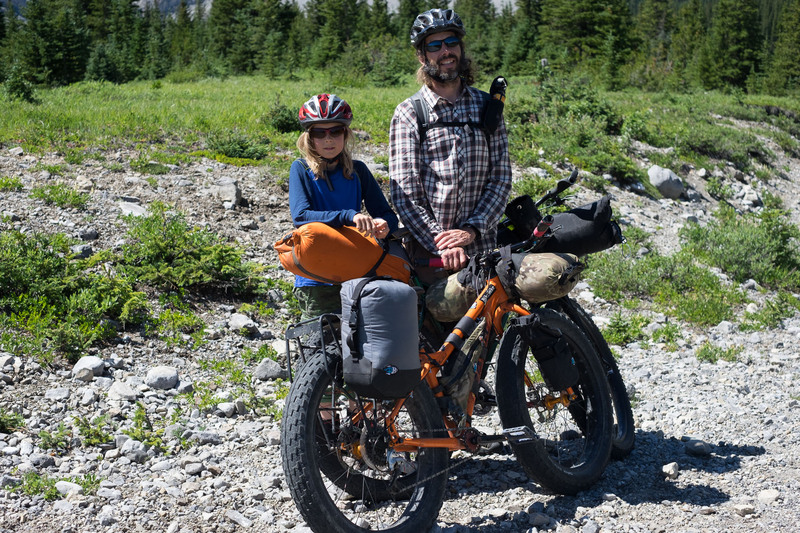 Tadhg and I had done the Elbow Loop trail a number of times before and we both enjoyed it as well as Elbow Lake and so we decided to add an out and back trip through Elbow Pass to Elbow Lake to the main 42km loop. Our first day started early in the afternoon after a swimming party in the morning. 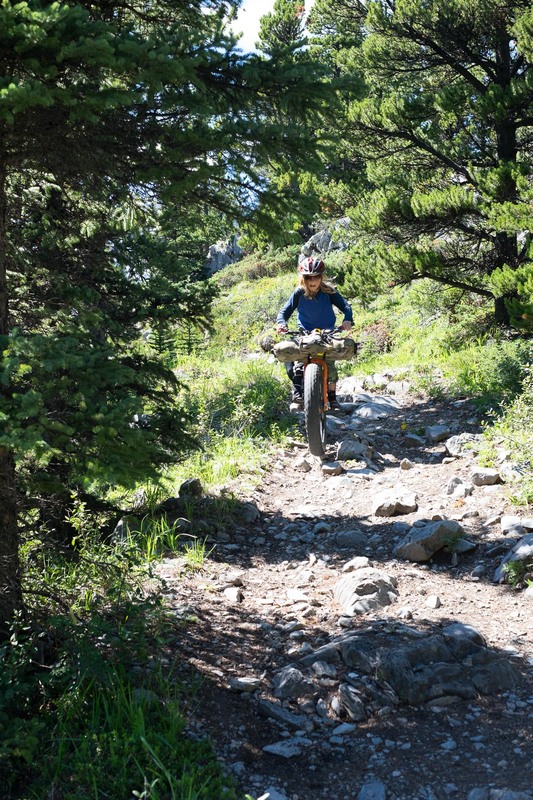 The first leg is an easy and relatively flat section of the trail to the Big Elbow campground. We had the entire campground to ourselves. 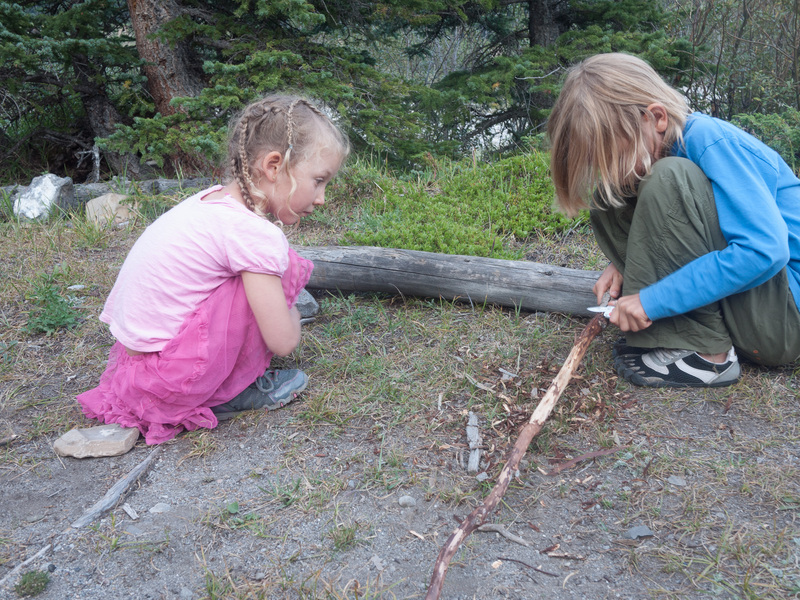 The kids played an assortment of games involving sticks and rocks and after a relaxing supper, we got to bed relatively early.